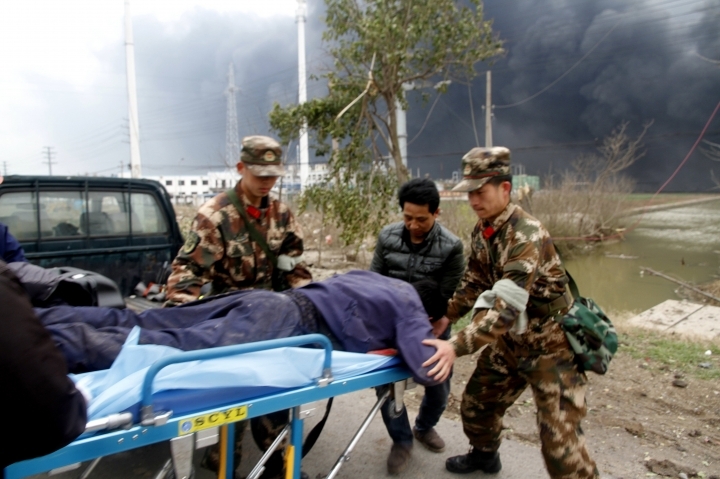 BEIJING — A massive explosion at a chemical plant in eastern China with a long record of safety violations has killed at least 62 people and injured hundreds of others, 90 of them seriously. 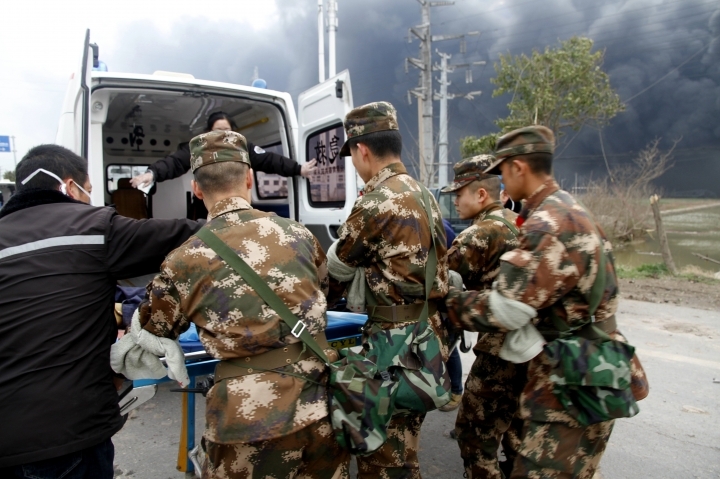 The death toll appeared likely to rise still further, with another 28 people still listed as missing, the official Xinhua News Agency reported Saturday. Just 26 of those confirmed dead in Thursday's explosion have been identified, it said. 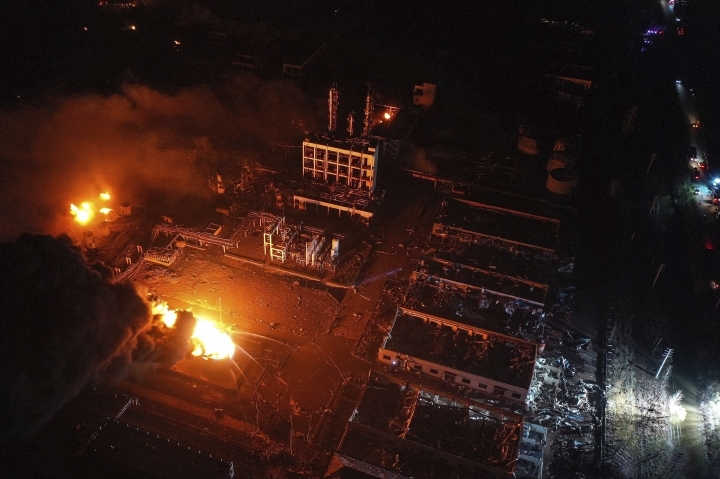 The blast in an industrial park in the city of Yancheng, north of Shanghai, was one of China's worst industrial accidents in recent years. State-run television showed crushed cars, blown-out windows and workers leaving the factory with bloodied heads. The blast created a crater, and more than 900 firefighters were deployed to extinguish the fire that burned into the night. Windows in buildings as far as 6 kilometers (4 miles) away were blown out by the force of the blast, which caused a magnitude 2.2 seismic shock. 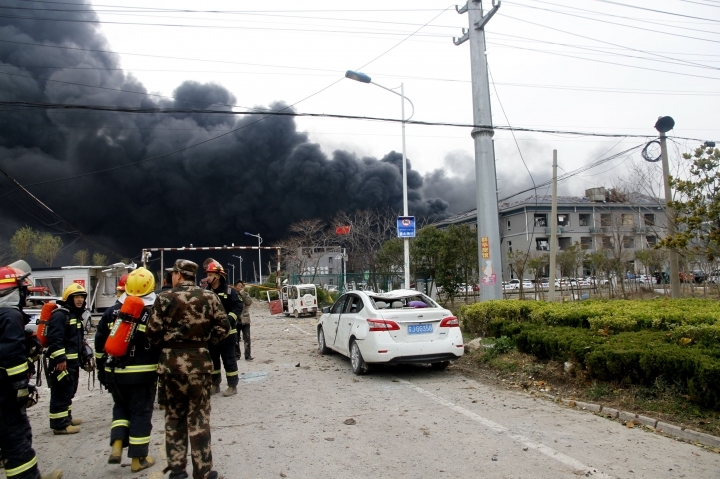 The cause of the blast was under investigation, and people responsible for operations at the plant have been placed "under control," Xinhua said. It wasn't clear whether anyone had been formally arrested. "At the time of the explosion, I was almost deafened and I was terribly frightened," said the woman, who gave only her surname, Zhi. "Relief work must be well done to maintain social stability. Meanwhile, environmental monitoring and early warning should be strengthened to prevent environmental pollution as well as secondary disasters," it quoted Xi as saying. 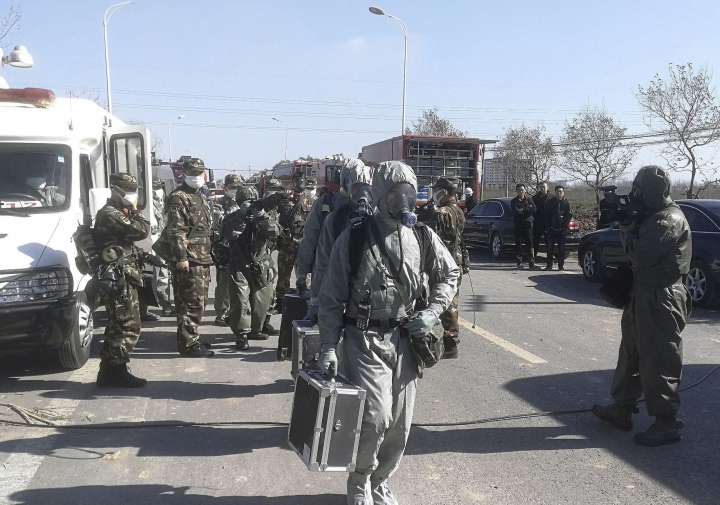 On Xi's orders, State Councilor Wang Yong led officials from the State Council, China's Cabinet officials to the explosion site to "guide the rescue and emergency response work and visit the injured people," Xinhua said. 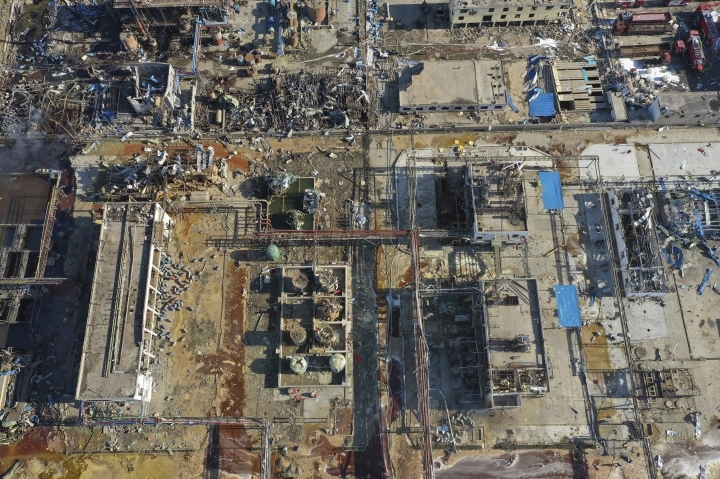 The State Council has been ordered to oversee the investigation into the cause of the explosion, an indication of the seriousness with which the government regards the incident. The U.N. said Secretary-General Antonio Guterres was "deeply saddened" at the loss of life and injuries and sent "heartfelt sympathies" to the families of the victims and to the people and government of China. 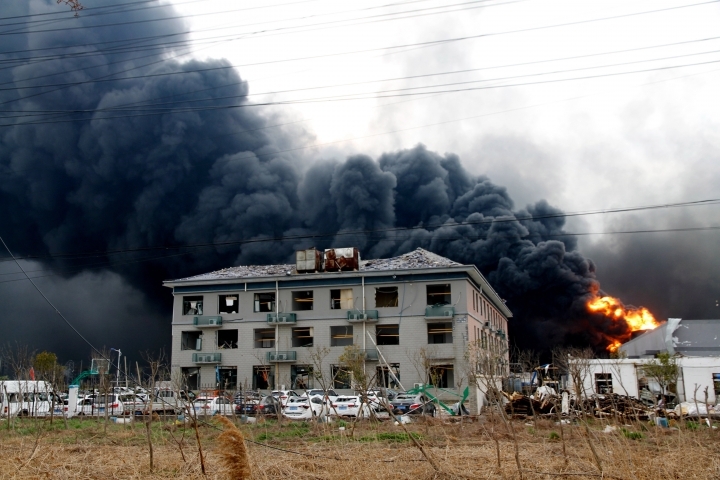 Thursday's disaster occurred at a factory run by the Jiangsu Tianjiayi Chemical Co. Located among a cluster of chemical factories in Yancheng, it has a dismal safety record: In February 2018, China's State Administration for Work Safety cited 13 types of safety hazards at the company, including mishandling of tanks of toxic benzene, believed to be the source of Thursday's explosion. Other local media reports said chemical fertilizer may have also been involved in the explosion. A 2017 explosion that killed 10 at a nearby plant prompted the State Administration of Work Safety to dispatch inspectors. 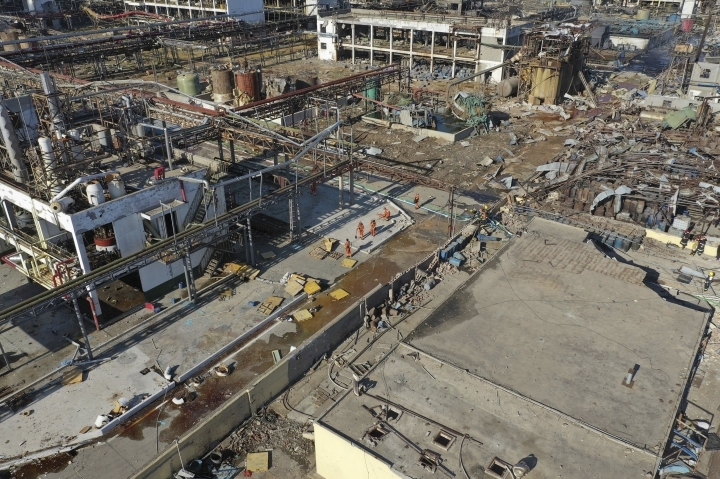 They discovered over 200 safety hazards at chemical factories in Yancheng and four nearby cities, including 13 at the Tianjiayi plant. Safety hazards cited included leaks and drips, employees who didn't understand safety procedures, and a lack of emergency shut-off valves on tanks carrying flammable chemicals. In 2014, the company's chairman, Zhang Qinyue, and Wu Guozhong, its former supply chief, were arrested on suspicion of dumping and burying hazardous waste byproducts near a temple and a village landfill, according to a Jiangsu court criminal judgment. They were convicted in 2017 and the company was fined 1 million RMB ($149,000).